I also know that the many layers of clothing you wear can be VERY CONFUSING!! I’ve had many a volunteer’s head spin when I first explain the order of putting on each garment! So to make it easier, I am creating a series of How-To-Dress Guides for each gender and job being shown at Pennsbury. These are not the somber, black-wearing Quakers of the 18th and 19th-century. They wore color and pattern, but just kept things simple (as opposed to their opulent monarchs!) Hopefully you will find this useful and even useful when talking to interested visitors! 1. Chemise: Women would start with this basic linen undergarment. It was a basic knee-length gown with fashionably pouffy sleeves to wear at night and underneath daytime clothes, absorbing the sweat and grime of daily life and protecting more expensive outer layers from getting more dirty between laundry days. 2. Under-Petticoat: This was not meant to be seen, and would be of a cheaper material than the Outer Petticoat. 3. Stockings: These could be made of woven fabric or knitted wool/cotton/silk. With no elastic at the time, they would be held up by ribbons/leather strap garters tied under the knee. 4. Shoes: Fashions for footwear were shifting from the long, squared toe to a more rounded shape, though always with a 1-2 inch heel. Shoes straps could be buckled or, as you see here, tied with ribbons. Most lower-class shoes were made of leather, though some could be dyed like these. 5. Stays: Make sure you get your shoes and stockings on before strapping yourself into this! This is a VERY important foundation garment for any woman of any station in life. They were NOT the rigid Victorian corsets of the 19th-century, but a supportive garment in the fashionable “cone” silhouette. Upper-class ladies would wear them fully boned with whale baleen, while middle/lower-class women would have them made with a bit more flexibility. Every volunteer/staff member that tries them on says they are completely comfortable – please don’t be afraid of them!! 6. Pocket: The early version of a purse, this was tied around the waist and used to keep your wallet, hankies, snack, and whatever else you felt like carrying! You can access the Pocket through the side slits of their petticoat. SECOND LAYER: Add Some Modesty! 7. Kerchief: This triangular scarf would wrap across the neck and shoulders for modesty. 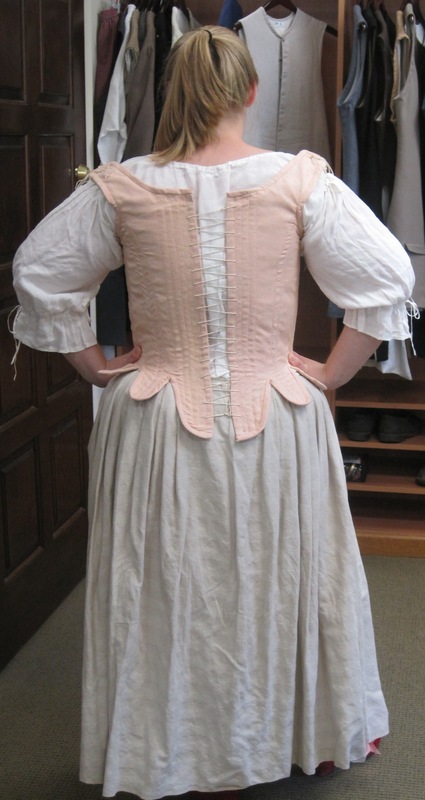 Quakers especially paid attention to their attire’s modesty, but all ladies would usually have something. Upper-classes could have them made of lace or silk. You can stuff this basic linen piece into the gown or pin it over the top of the whole outfit. 8. Outer Petticoat: Petticoats served two functions. The most practical was warmth, very important when fireplace heating was insufficient. They would also fill in your gown and create a full shape. Upper-class ladies could wear up to 7 petticoats at once! But working women were practical, so in the summer you could wear 1 and in the winter 2-3 would keep your legs nice and toasty. This outer petticoat would be of the nicest of them all, and usually is worn over top of the stays. 9. Mantua Gown: This style is overwhelming the most popular style seen in all paintings, sketches, and engravings of the period. First adopted by the upper-class ladies, it was quickly picked up by the working classes and replaced almost all preceding styles. A couple other gown styles that can be used, but almost all women appear in a version of this. The gown features pleated folds across the upper body and a pulled-back skirt to showcase the petticoat underneath. 10. Apron: This was a practical garment for working women who wanted to protect their gowns from getting dirty. Upper-class ladies would sometimes wear aprons of lace as pure decoration, but most were made of linen. 11. Hood: This was the most fashionable head covering for lower/middle-class women, though you would also see traditional winged caps. Court ladies would wear a Fontage of lace stiffened with wire. These headdresses would sometimes reach 1-2 feet in the air. 12. Stomacher: You can’t see this triangular-shaped piece in Ruth, since her gown pins closed in the front, but this was often as a finishing touch. It would fill the gap between the front flaps of the gown, covering plain stays with a richer fabric and adding some decoration to any lady’s ensemble! 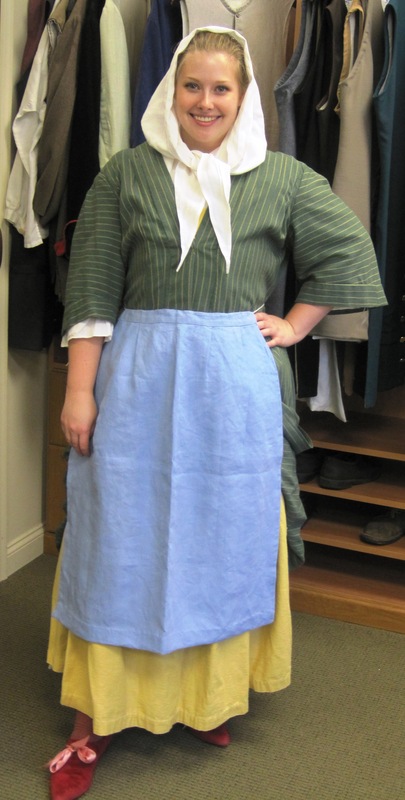 Top this look off with a straw or felt hat (and a cloak in the winter), and you’ll be the picture of colonial fashion! Look for more in-depth posts on the garments featured here, and more of men’s and women’s fashion, coming soon to the Volunteer Blog! This entry was posted in Confessions of a Costumier and tagged 17th century, 18th century, costume, dress, fashion, gown, historic site, mantua, museum, Pennsylvania, period clothing, petticoat, Philadelphia, stays, William Penn. Oh cool, thanks Cheryl. I’m heading there in November for a conference at Plimoth Plantation, so I’ll definitely check it out. Maybe they’ll let me take some non-flash pictures if I’m really nice??! I’ll be doing a post on their gorgeous 1670s stays in the new year, so stay tuned!! Thank you for all these pictures! 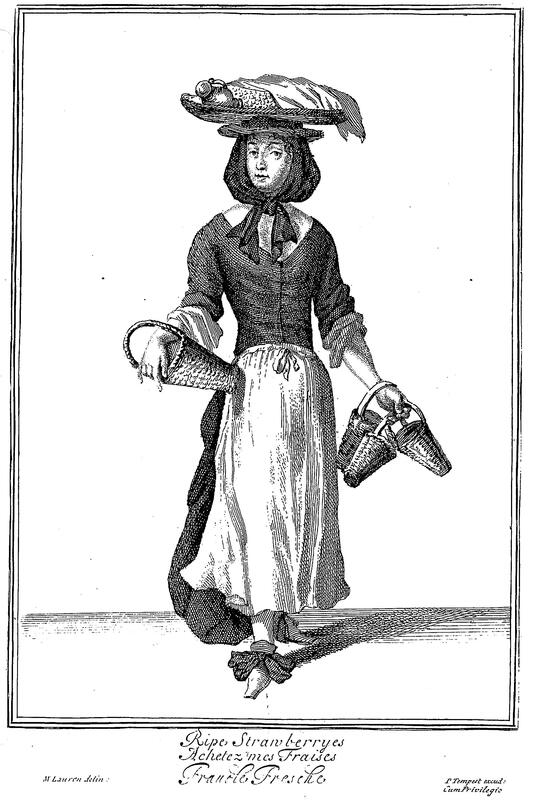 I am currently doing a costume design set in 1665 and images of these working class outfits are so rare. Great explaination and photo’s and great costumes! I appreciate your use and description of the changes I initiated when I was volunteer and curator at Pennsbury Manor 1990-1994. This article justifies the time and effort dedicated to developing a period clothing program at Pennsbury Manor grounded in solid research. I am glad to see that although uncredited my research, planning and clothing design has not been lost.